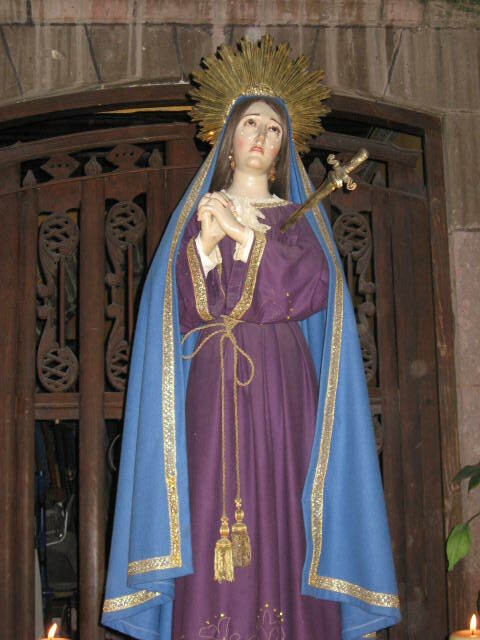 Upon our arrival in San Miguel de Allende for Holy Week, Rebecca led us to venture out to participate in Viernes de Delores…a celebration of Delores, Our Lady of Sorrows, who is typically depicted with up to seven daggers piercing her heart. 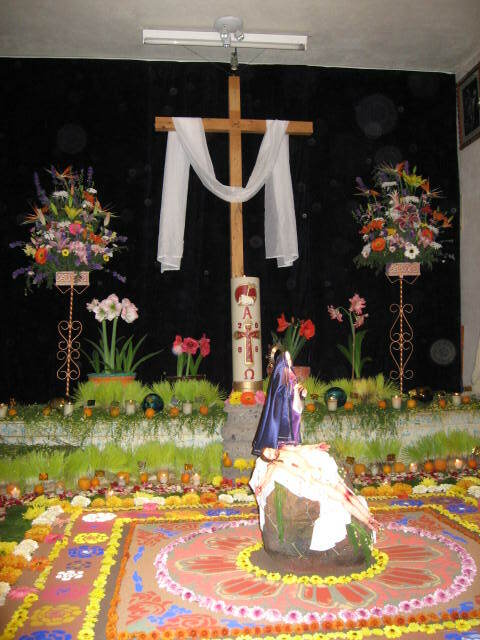 Families and businesses erect giant altars that include Our Lady and certain specific elements such as oranges, wheat grass, tons of flowers, and more – each representing faith, purity, and a host of other virtues. Elaborate decorations and flickering candlelight create a mood of both reverence and joy as Holy Week begins. I am sorry to report that because Mr. E. and I are heading up to Northern California for 5 days, I will greatly miss reading everyone’s Virgin a Day posts, as well as contributing my own offerings. I look forward to continuing this journey with all of you when I return next Wednesday. Be sure to visit Rebecca @ http://corazon.typepad.com/ to cover even more Virgin territory. ~ by Dawn Elliott on December 1, 2011.
travel safely and enjoy each moment, something the two of you do so well. this is a magnificent post which so stirs my heart with the intimate celebrations of san miguel that we continue to be blessed in sharing. i am sure you will be on the hunt for marys on your trip…can’t wait to see what you discover! i would love to see one of those altars in person. 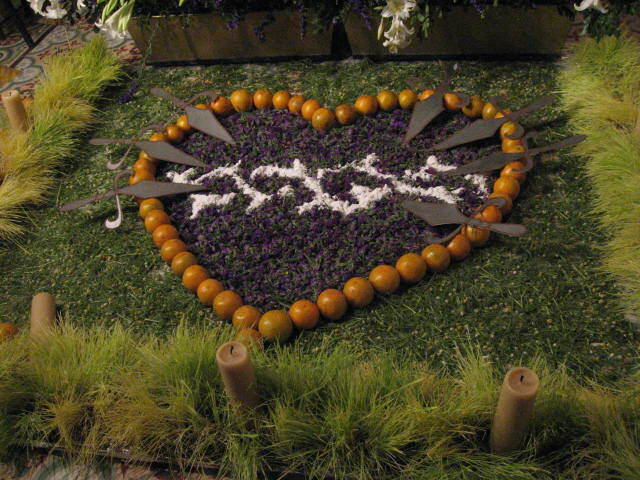 Absolutely love the Heart made with oranges! Thanks for sharing, and I pray for traveling mercies for you. This display is beautiful. Some day, I will get to San Miguel. I will miss your Virgin stories and will hang around for when you return. Northern California, I am very familiar with everything North of San Francisco. I lived near Eureka amidst the redwoods. Have a great trip. I love seeing these images of San Miguel. I am going there with rebecca in January. Have a safe and wonderful trip! And, thank you for sharing this!